A wide range of bin sizes! Are you tired of never getting the skip bins of the size you ordered? Do you generally have to wait forever for your skip bins to arrive? Then you need to switch to Blue Heeler Bins. We can provide you with a punctual and organized waste removal service in Beverly Hills. You will realize how stress-free waste removal actually is. We can guarantee that you will never be disappointed with our services. The Blue Heeler Bins service area is very vast and we will reach you wherever you are located within our map. Our services include Cheap Skip Bins Sydney and Rubbish Removal Sydney. We have bins of diverse sizes for you to choose from, depending on the nature and size of your waste removal needs in Beverly Hills. We even have crane bins so you can always place your bins in those hard to reach places. Garden waste, recyclable material, household garbage or construction site waste, whatever kind of waste you may have, we will help you dispose of it in an environmentally friendly way. Our mission is to help you get rid of your rubbish in the easiest and most efficient manner. This in turn will help make your household, neighbourhood, city and country clean and healthy. Our staff has all the necessary training and experience to perform their tasks with the greatest efficiency. They are punctual and will always deliver your skip bins on time. You will no longer have to waste your time, energy and money on rubbish removal services that do not deliver a 100% satisfactory job. 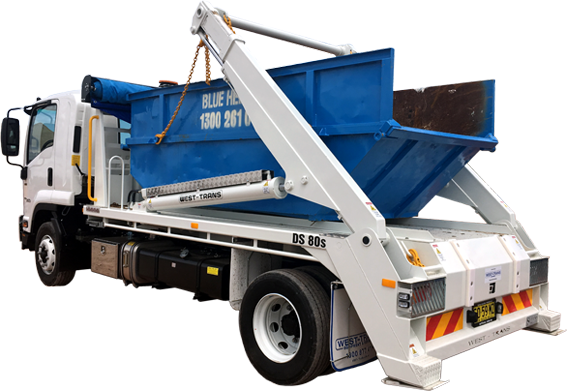 To get a stress-free waste removal service in Beverly Hills, simply contact Blue Heeler Bins on 0418 238 210 or 1300 261 041. You can even submit an online enquiry on our official homepage. Read our blog for the latest updates on our services. our monthly promos and specials! I found Scott and his team really reliable. They did everything they said they would, turned up within the time frame they gave, trustworthy and very helpful. I would absolutely recommend them to anyone. Highly recommend this company for fabulous service. I called for a bin late afternoon and in spite of doubts that the bin could be delivered before 10 am the next morning, I had one just after 7 am. Scott was obliging and helpful and the driver was also very polite and very careful with placing the bin in a difficult spot out of the way of other machinery and activities.